Nina Polvanich Louie crossed at the Zeta Chapter, Stanford University, of alpha Kappa Delta Phi Sorority as part of the Zeta Class in Fall 1999. After graduating, she spent a few years of consulting at McKinsey & Company in Thailand. She returned to the United States to complete her graduate studies at Harvard University, where she met Mike, the love of her life! After a few years, they ended up on the West Coast, married and with an adorable son, Donovan. Around Donovan’s second birthday in September 2012, Nina felt something was not right with herself. She received life changing news – at 32 years old, she was diagnosed with Stage IV lymphoma, an aggressive blood cancer. 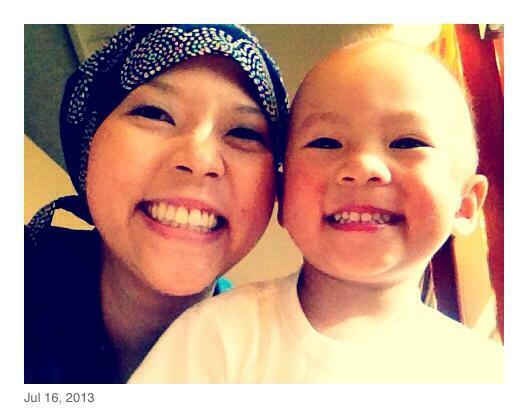 Throughout her fight, Nina has been an inspiration to all of us, staying strong, battling this disease, being a role model for her son, and also bringing light to the major gap in Asian American registrants in the bone marrow registry. A bone marrow donation is one of the most viable methods of battling lymphoma and a match is more likely to be found in someone of the same ethnicity. The Save Nina campaign launched in May 2013 order to help Nina and others battling diseases come closer to finding a match for a bone marrow transplant. Since she is of Chinese/Thai descent, she was informed that her chances of finding a match in the bone marrow registry is 1 in 20,000. Save Nina has gone viral internationally with hundreds of drives hosted by friends and sisters, which have typed thousands of people across the country. Celebrities like Boyz II Men, Hello Kitty, Jamie Chung, Chef Morimoto, Sonia Kapadia, Kristen Bell, Jenna Ushkowitz, Sheryl Sandberg and more have helped spread the word through social media. Many Asian associations and corporate companies have hosted typing drives at their local events and within their headquarters. Throughout it all, Nina remains gracious and strong.